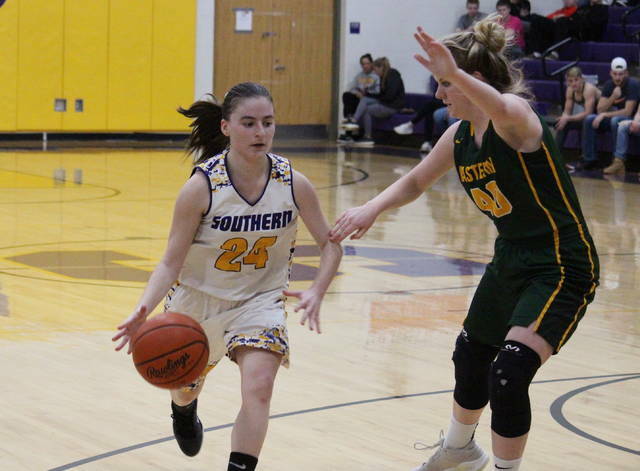 Eastern’s Jaymie Basham (42) brings the ball across midcourt in front of Southern’s Brooke Crisp (24), during the Lady Eagles’ 58-16 victory on Thursday in Racine, Ohio. Southern senior Jackie Dailey dribbles near the top of the key, during the Lady Tornadoes’ setback on Thursday in Racine, Ohio. RACINE, Ohio — The Lady Eagles are headed into the postseason the best way possible, with a winning streak. 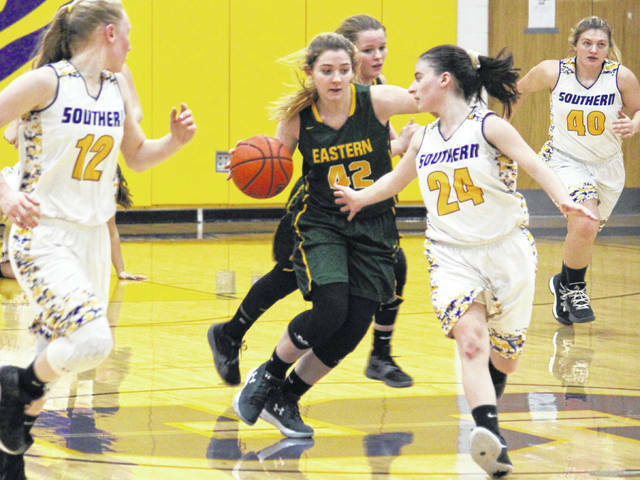 The Eastern girls basketball team won its third game in a row on Thursday in Meigs County, defeating Tri-Valley Conference host Southern by a 58-16 tally in the regular season finale for both teams. Eastern (13-8, 13-3 TVC Hocking) scored the game’s opening bucket, but Southern (0-22, 0-16) hit back-to-back three-pointers and led 6-2 with 5:45 left in the the first quarter. The Lady Eagles closed the first on a 6-0 run and led 8-2, but the hosts hit another trifecta to open the second period and led 9-8. Eastern, however, ended the half with a 20-0 run and took a 28-9 advantage into the break. The guests continued their run, scoring the first 10 points of the second half to make the margin 38-9 by the midway point of the third quarter. Southern ended it’s 12-minute cold spell with a two-pointer at 3:00 mark of the period, but EHS scored four of the next five points and led 42-12 at the end of the stanza. The Lady Eagles closed the game with a 16-to-4 run, sealing the 58-16 win. Following the triumph, Eastern head coach Jacob Parker talked about his in-game adjustments, and the momentum the Lady Eagles have as they prep for the postseason. “In the first half we came out flat,” Parker said. “We had to make some adjustments in the second half, we made them, and we played much more of our style of basketball. When we play the way we practice, good things happen. Conversely, SHS head coach Alan Crisp noted that all the momentum his club gained in the 58-50 setback to Belpre on Wednesday was now lost. Eastern connected on 21-of-53 (39.6 percent) field goal attempts, including 3-of-15 (20 percent) three-point tries, while Southern was 5-of-41 (12.2 percent) from the field, including 3-of-13 (23.1 percent) from beyond the arc. At the foul line, EHS was 13-of-26 (50 percent), while SHS was 3-of-13 (23.1 percent). The Lady Eagles outrebounded their host 39-to-29, including 19-to-10 on the offensive end. Eastern committed 16 turnovers in the win, while SHS had 28. The guests combined for 17 steals, 14 assists and four blocked shots, while the Lady Tornadoes collected five steals, five blocks and three assists. Olivia Barber led the Lady Eagles with game-highs of 12 points and eight rebounds. Barber also paced the guests on defense with three steals and three blocked shots. Alyson Bailey contributed 11 points to the winning cause, Kennadi Rockhold added nine points, while Kelsey Casto chipped in with six. Ashton Guthrie scored five points for Eastern, while Jess Parker and Tessa Rockhold finished with four apiece, with Parker earning a game-high four assists. Jaymie Basham tallied three points for the guests, while Brielle Newland and Sydney Sanders added two apiece. Southern was led by Jordan Hardwick with eight points, followed by Kayla Evans with four points, seven rebounds and an assist. Phoenix Cleland scored three points, and also came up with seven boards and an assist, while Caelin Seth had one point in the setback. 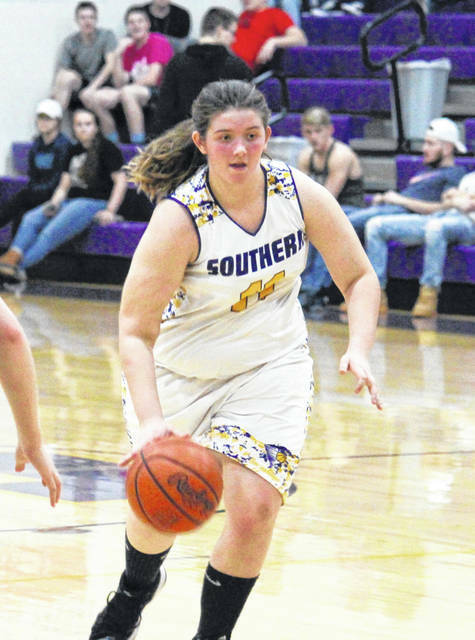 Jackie Dailey — Southern’s lone senior, playing in her final home game in the Purple and Gold — recorded an assist for the hosts. Hardwick paced the SHS defense with three steals and a block, while Phoenix Cleland came up with two blocks and a steal. 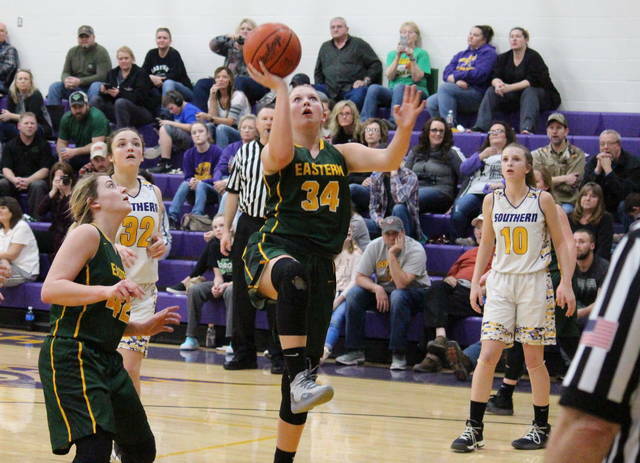 Eastern improves to 2-0 against the Lady Tornadoes this winter, as the Lady Eagles won by a 54-28 on Jan. 7 in Tuppers Plains. Both teams head for the tournament next, with Southern facing Miller on Wednesday, and the winner playing Eastern on Saturday.